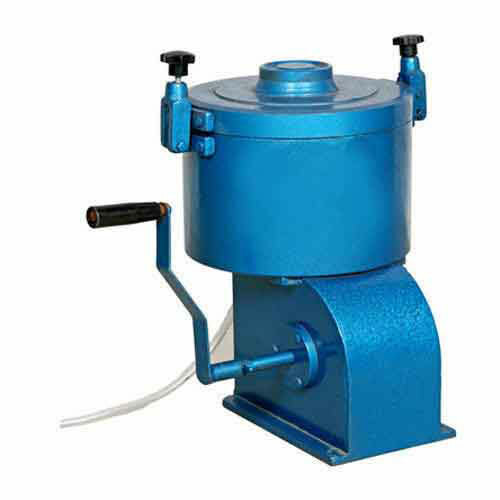 Centrifuge Extractor (Hand Operated) Description: SE-Test India’s, an eminence manufacturer & supplier of testing instrument Centrifuge Extractor (Hand Operated), model no. SET-1305 conforms to the ASTM D2172, AASHTO T-58, T-164 industry standards. Centrifuge Extractor (Hand Operated) is basically used in checking and determining the quantitative Bitumen percentage in the bituminous mixtures. In Bituminous mix, a solvent is added and by centrifugal action bitumen is removed. In detail, the bowl is mounted on the vertical shaft that protrudes from the cast housing. The bowl, mounted on a shaft, is rotated manually very fast by the enclosed gears in the cast body with the attached handle. Then, the solvent is added slowly through the housing cap holes. An external drain is provided which collect the dissolved Bitumen that is coming out of the moving/rotating bowl and collected in the housing. SE-Test India Pvt. Ltd. Centrifuge Extractor (Hand Operated) is successfully utilized in diverse parts of the different industries varying from automobile, food, pharmaceuticals, manufacturing, oils & gas etc. Comes with Cylindrical Aluminum rotor bowl with a capacity to carry 1500 gms sample mix, which is easily removable. A cap for the bowl, which prevents leakage too.